Promoting an upcoming rally by the left-wing group, Schiavocampo declared it "could be their largest event yet." She then observed: "The grassroots movement has no official leaders." On the April 16, 2009 NBC "Nightly News," the day after nationwide Tea Party tax day protests, correspondent Lee Cowan attempted to discredit the grassroots nature of the movement: "Organizers insist today’s 'tea parties' were organic uprisings of like-minded taxpayers from both parties....But some observers suggest not all of it was as home-grown as it may seem." 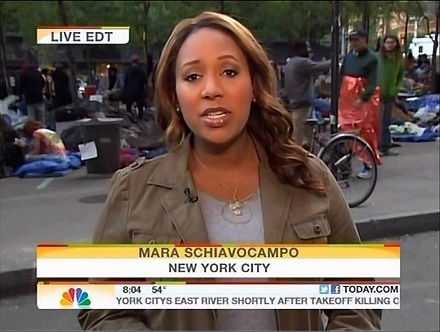 Near the end of Schiavocampo's Wednesday report, liberal Washington Post writer Jonathan Capehart offered some advice to the unfocused protesters: "'Occupy Wall Street,' if it wants to be successful, they're going to have to zero in on specific pieces of legislation." Schiavocampo concluded the segment by passing along a request from the leftist activists: "Organizers are also hoping students will join them in today's events. They're asking college students across the country to walk out of class at 2:00 this afternoon, in a show of solidarity." Over the past week, NBC has continually pumped up the liberal movement, even suggesting it was the equivalent of the Tea Party. TAMRON HALL: Today could be the biggest day yet for the "Occupy Wall Street" protests in lower Manhattan. NBC's Mara Schiavocampo is there with more. Mara, good morning. MARA SCHIAVOCAMPO: Tamron, good morning. Protest organizers say they are expecting thousands today for a rally and march here in lower Manhattan. The "Occupy Wall Street" coalition is growing quickly, as several labor unions have now vowed to join demonstrators in their protests against corporate interests. Three weeks in, and no signs of slowing. 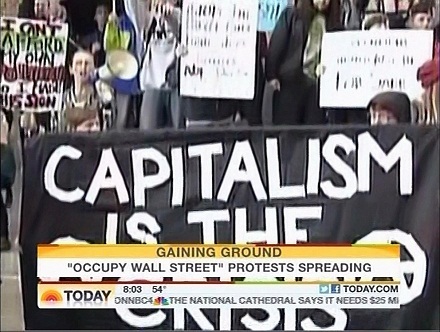 The "Occupy Wall Street" protest growing in size and scope. Hundreds gathering to vent their frustration at big banks and corporations, demonstrations spreading to more than 50 cities, from Boston to Los Angeles. Protesters now joined by some very influential allies. UNIDENTIFIED MAN: We are powerful, thank you! SCHIAVOCAMPO: Tuesday, several labor unions, including transit workers and teachers, joined activists for a march to Wall Street. Today they plan to join protesters in what could be their largest event yet, a rally and march in lower Manhattan. The grassroots movement has no official leaders. UNIDENTIFIED WOMAN: We the people are here to take the power back. SCHIAVOCAMPO: While their frustration is clear, their goals are not. JONATHAN CAPEHART [WASHINGTON POST]: "Occupy Wall Street," if it wants to be successful, they're going to have to zero in on specific pieces of legislation. SCHIAVOCAMPO: A movement still taking shape as it continues to grow. Organizers are also hoping students will join them in today's events. They're asking college students across the country to walk out of class at 2:00 this afternoon, in a show of solidarity. Tamron. HALL: Alright, Mara, thank you.